Abi slept about 6-7 hours straight. She looks much better this morning. She was fussing a bit when we came; I guess She's just fed up with this place and wants to go home. I know we do. She had PVC (Premature Ventricle Contractions) going on several times a minute over about 3-4 hours so they increased the air flow a bit since this could be caused by not having enough oxygen reserve. Quite normal after this complex surgery. They have also increased the amount of food she's getting to 15 ml an hour. 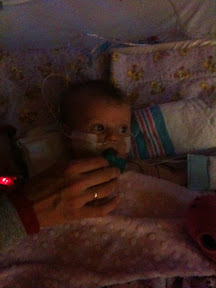 The plan is they will discharge her from CICU today! Next she needs to start eating and retaining the food. This is our next goal!